A thousand years ago, Chacoan people built multi-story buildings and engineered roads in the high desert of New Mexico. 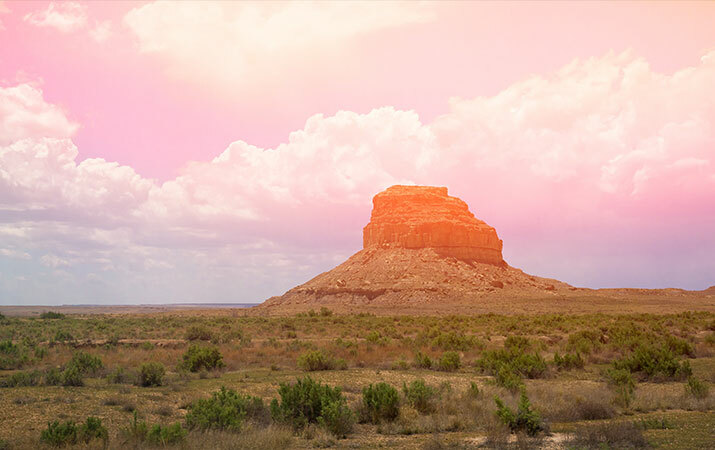 Chaco Culture National Historical Park preserves the legacy of this ancient culture. Here kids can explore stone ruins from a previous millenium, step through T-shaped doorways, go up and down stairs of multi-story buildings, and look out through windows into the endless desert sky that goes on forever. From 100 – 1600 AD, Anasazi (Ancestral Pueblo) people lived in Four Corners area (New Mexico, Colorado, Utah, Arizona). They farmed corn, beans and squash, made cotton cloth and pottery, built settlements in canyons and cliff sites. Around 850 AD, the Anasazi began constructing huge stone building complexes in Chaco Canyon. Chaco became the ancient center of a culture linked by a network of roads and over seventy settlements many miles away. Today, Hopi, Navajo, and other Pueblo Native Americans trace their spiritual and cultural history to Chaco. 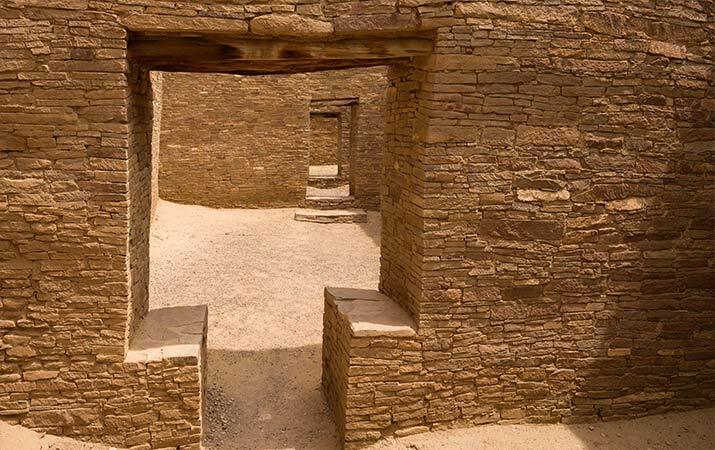 Chacoan people were superb engineers, builders, and sky watchers, but there’s no known written language, and the way of life in these settlements remains an archaeological mystery. The monumental architecture and straight roads of Chaco are unique in the ancient Southwest. The building complexes, called great houses, have hundreds of rooms, a central plaza, and kivas, circular-shaped underground chambers. With stone tools, they cut sandstone out of nearby cliffs, shaped it into blocks, made walls by sticking together millions of stones with mud mortar, covered the walls inside and out with plaster, constructing buildings up to five stories high. The ancient Chacoans were also road builders. Archaeologists have discovered straight roads running through the desert, extending from Chaco Canyon hundreds of miles into Colorado and Utah. Roads radiate out from great houses like spokes in a wheel, others line up with natural land forms; some packed earth roads are 30 ft wide. One theory is these roads are sacred paths, followed by pilgrims for ceremonies at Chaco Canyon and other great houses. Archaeologists have researched Chaco since the late 19th century, but despite enduring stone ruins, how Chacoan people lived, what was their society like, why they stopped building and moved away in 12th century, is still a puzzle. 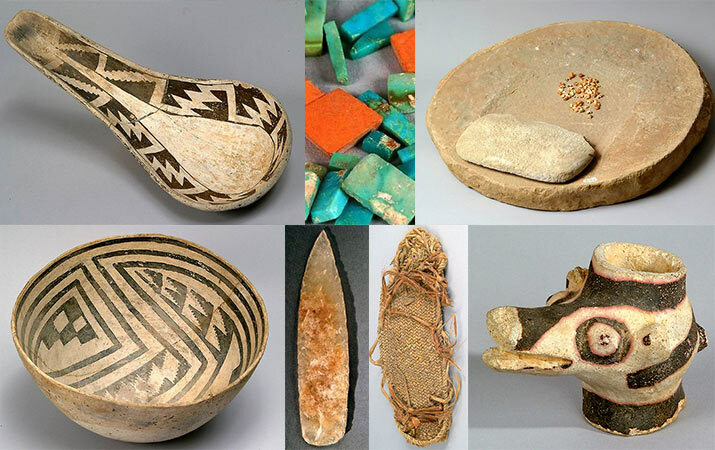 Here’s some of the artifacts archaeologists discovered at Chaco – ceramics, decorated with geometric designs, for bowls, canteens, cooking pots, ladles, pitchers, mugs, water jars (olla), black stone finger rings, shell necklaces, turquoise pendants, wooden headdresses, whistles and flutes, stone knives and axes, ceremonial staffs, sandals, fragments of cloth, feathered cloaks, metates for grinding corn, conch shell trumpets, arrows, pottery in the shape of deer, birds, humans. Corn was a staple for the Chacoans, along with squash and beans, cotton for cloth, cultivated by farmers in villages, some miles away. Using bows and arrows, they hunted animals for meat, and made fine pottery for offerings and home use. Underground kivas were painted with murals, and there may have been music and dancing for ceremonies. Chaco traded for turquoise and shells which came from hundreds of miles away, imported macaws and drank cacao from Central America. Chaco was an important ceremonial, trading and administrative center in a sacred landscape, laid out in a network of roads connecting to the great houses. One theory is pilgrims came to Chaco with offerings, and participated in rituals and ceremonies at auspicious times. It’s unlikely large numbers of people lived here year round, despite hundreds of rooms, which may have been used to store objects. Tip: Many artifacts excavated from Chaco are not on display in museums around the country. At the museum in Aztec Ruins, kids can see some original artifacts – see below. 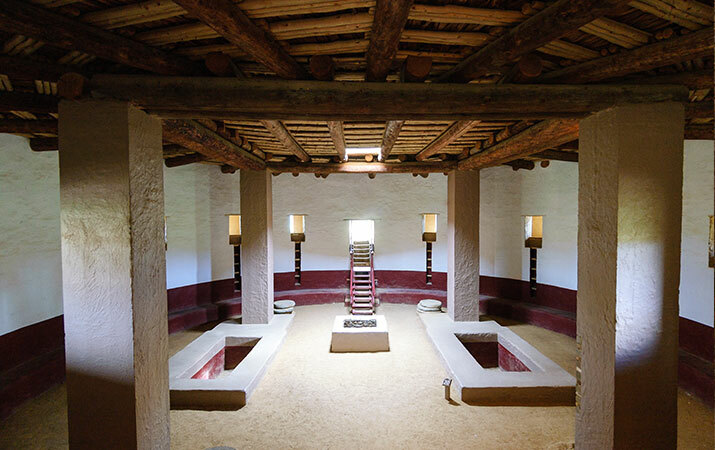 Una Vida is a “great house” in a L shape, with two and three story buildings, a central plaza with great kiva. Ceremonies and large gatherings took place in the central plaza. Construction started in 850 AD, and continued for the next 200+ years. It might not look like much, as it is unrestored, stone walls crumbling. When you walk on the one mile trail loop around the site, much of the ruins are sitting underneath your feet, covered by desert sands. The trail through the site goes along the cliffs – look for petroglyphs carved in the sandstone. 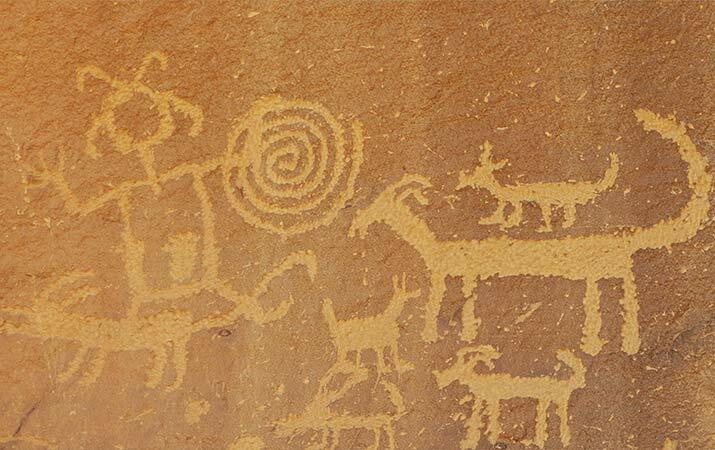 Petroglyphs relate to clan symbols, records of migrations, hunting, and important events. Some of the petroglyphs are carved high up, 15 feet above the ground. 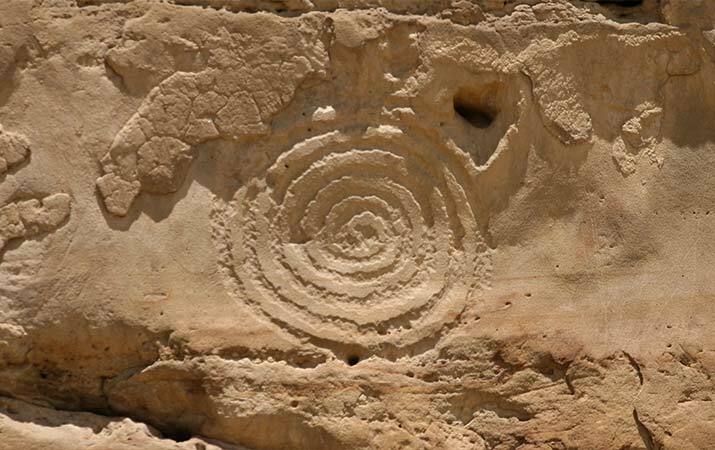 Images in the petroglyphs are birds, spirals, animals, human figures. 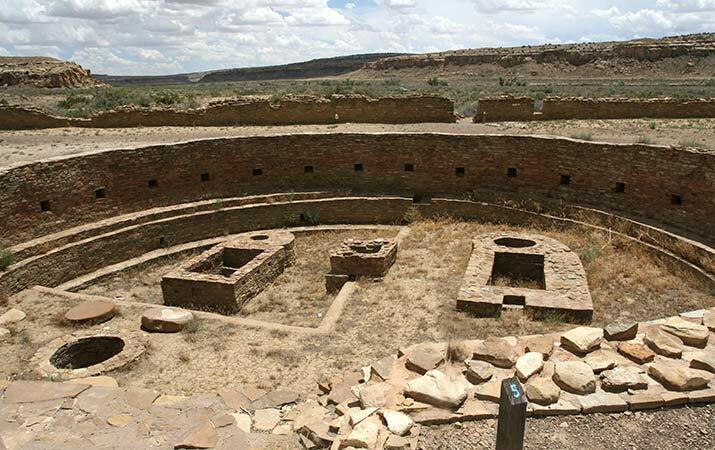 Chetro Ketl is the second largest Chaco great house, with 500 rooms in the site, 16 kivas. Like Pueblo Bonito, it’s D shaped, with hundreds of interconnected rooms, and multi-story buildings, great kiva in a large central plaza. It took about 50 million stones, that had to be cut, shaped and put in place, to build Chetro Ketl. What’s unique about Chetro Ketl is the central plaza. Without wheeled carts or domesticated animals, the Chacoans transported massive amounts of rock and dirt to raise the central plaza 12 ft higher than the natural landscape. Hiking on the trail near the cliff (Stop 12), look up to see a stairway and handholds carved into the rock. This is part of a straight road that connected Chetro Ketl with another great house on the cliff, Pueblo Alto. Tip: Walk on the trail that goes from Chetro Ketl to Pueblo Bonito to see more petroglyphs on the cliffs. The complex is built in a D shape, with 36 kivas, 600 – 800 connected rooms, some of the buildings are five stories high. Pueblo Bonito served as a center for ceremonies, trading, storage, astronomy, and burial of the dead. Burial caches under the floors in rooms at Pueblo Bonito include artifacts such as a necklace with two thousand turquoise squares, a turkey feather blanket, conch shell trumpets, quiver and arrows, ceremonial staffs, black and white cylinder jars, painted flutes, turquoise mosaics. These items were buried with high status people. Tip: In the Visitor Center, buy the booklet that explains each of the numbered stops in this large complex. When you stand next to the great kiva (Stop 10), look down into the huge circular chamber below the ground – hundreds of people could have gathered here for ceremonies. The kiva has a low bench all the way around the chamber, four masonry squares to hold the wooden or stone posts to support the roof, a square firebox in the center. In the wall are niches, perhaps used for offerings or sacred objects. A ladder through the roof provided entrance into the kiva. Exploring the site, you’ll see holes in a line in the masonry walls. This shows where wooden roof beams were inserted to support the next story above. As you walk through Pueblo Bonito, look for different door shapes – small doors with a high sill to step over, others are larger doors with a low sill, corner doorways (used as astronomical markers), and T shaped doors. Stop 16 has a T-shaped door, Stop 18 a corner door high up. Short doorways are the perfect size for kids to go through, adults will have to bend over. At Stop 17 to see the original wooden roof and walls of the room re-plastered to show how it would have looked a thousand years ago. Bring food and water – Even for a day trip, bring food and water – no services are available in the park. Stock a cooler with plenty of water for your family. It’s quite hot in summer, and even with short walks to the ruins, you don’t want to get dehydrated. Visitor Center – Stop in the Visitor Center to pick up maps and explanatory booklets about Chaco sites. There are covered picnic tables, restrooms, and drinking water. Stay on trails, don’t climb on walls – The ruins are fragile, and need to be preserved – they are part of the sacred history of Southwest Native Americans. Even if you see bits of pottery on the ground, don’t pick them up – these are protected artifacts. Bring binoculars – To see details of the petroglyphs high up on the rocks, binoculars are helpful. Wear closed-toed shoes – The ground at Chaco is dusty and rocky, wear closed-toed shoes, not flip-flops. 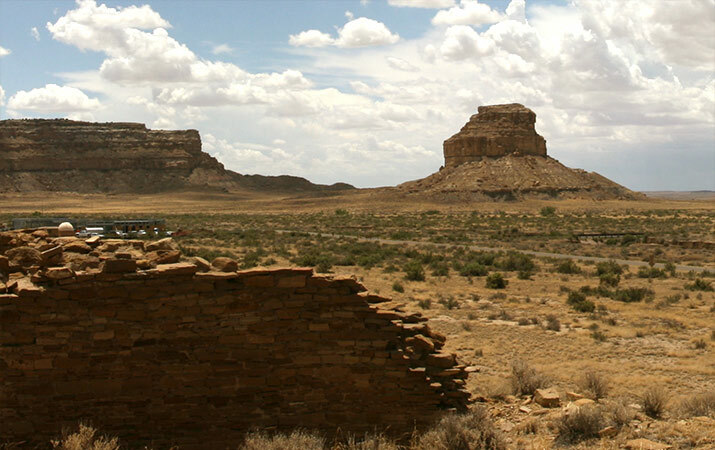 Aztec Ruins, 55 miles to the north of Chaco Canyon, is a continuation of the Chaco story. 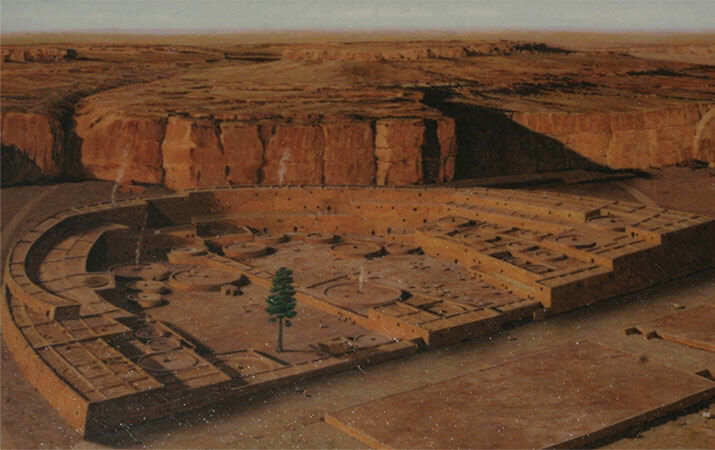 Around 1100 AD, as people moved away from the great houses in Chaco Canyon, Aztec became an important center, occupied and expanded over the next 150 years. Aztec Ruins (no connection to the Aztec in Mexico) has architecture very similar to Chaco – great houses and kivas, multi-story buildings, roads radiating out. What you see today is only a quarter of a very large site, the rest is unexcavated and buried under earth and vegetation. Before going out to ruins, stop into the Museum at the Visitor Center, to see exhibits with artifacts excavated from the ruins – black and white mugs, canteen, bowls, vases with geometric designs, bone tools, stone knives, an original ladder, plus a model of the ruins. A primary reason to visit Aztec is the restored great kiva, 70 ft in diameter, 16 ft tall. The roof is supported by four masonry columns, walls are painted red and white (colors re-created from plaster fragments found in the excavation), firebox in the center. Two rectangular pits in the center may have been covered with wooden planks for use as “foot drums” during ceremonies. As I write this post (March 2018), Dept. 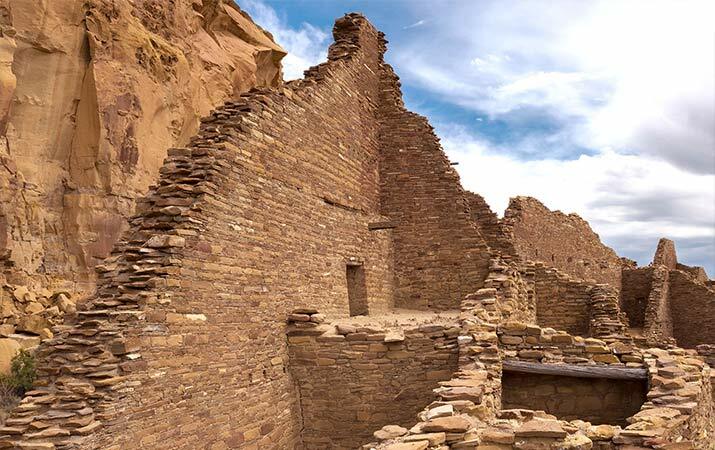 of the Interior is considering leases for oil and gas drilling close to Chaco Culture NHS, without a plan to protect this cultural heritage and environment. Miles of existing ancient roads, and buried cultural sites (which can be seen with ground penetrating radar) could be destroyed forever. Is it a good idea to drill for oil and gas next to Machu Picchu? The answer is no. And no for Chaco Culture National Historical Park.